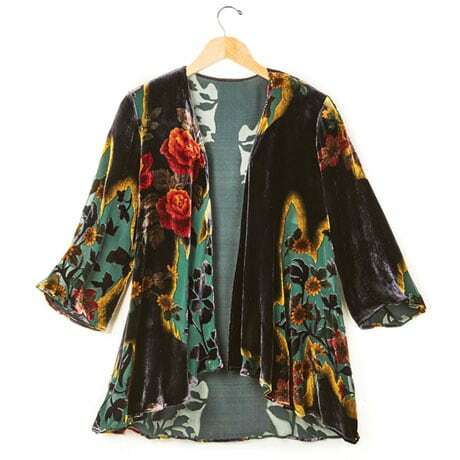 Lush flowers bloom on a dramatic ground of black velvet and sheer burnout. Gorgeous over a simple black shell or tank dress, open-front jacket has a waterfall front, 3/4-length sleeves, and gently flared shape. Silk-rayon velvet. Hangs 31" in back. Sizes S(4-6), M(8-10), L(12-14), XL(16-18), 1X(20-22), 2X(22-24). Dry-clean. Imported.